Masdevallia is a genus of some 350 species usually from cool, misty mountains of the New World Tropics. 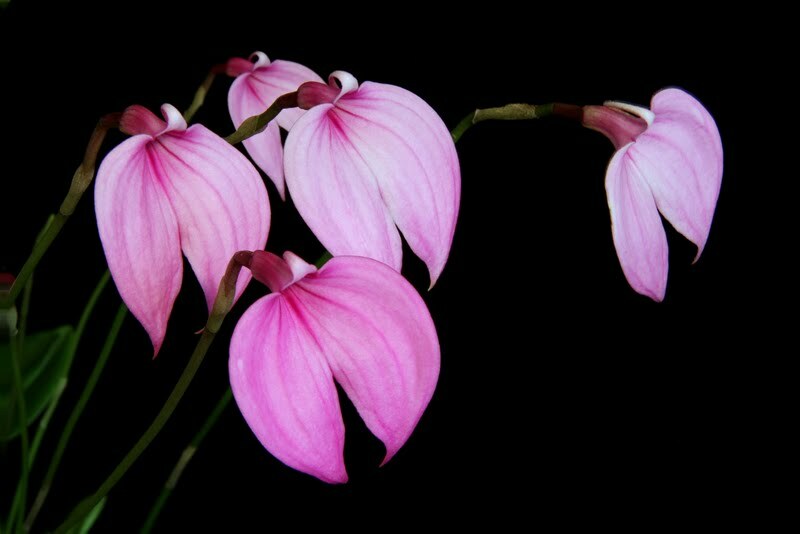 Masdevallias are best known for their showy flowers consisting of sepals fused into a tubelike structure. Their origins in cool, damp environments make them an excellent choice for cool or coastal climates. Most species and hybrids are compact enough so that they can be easily accommodated on windowsills or under lights. Light should be like that given for phalaenopsis and paphiopedilums —1,000 to 1,500 foot-candles. Masdevallias can be kept in light intensities up to 2,500 foot-candles if the growing area can be kept cool. Plants grow well under standard fluorescent fixtures and can be summered outside in shade. In the home, place in an east or shaded south window or under artificial lights. Temperatures should be cool to intermediate. The plants will grow slowly and eventually expire if temperatures remain high for long periods. Cool evenings help reduce heat stress during the day. Nights of 55 to 60 F are ideal; day temperatures should be 65 to 75 F. Evaporative cooling pads or humidifiers are useful in maintaining these conditions. Avoid day temperatures higher than 80 F.
Water is critical for these plants because they have minimal water-storage tissue. Roots should be allowed to become almost dry before watering again; if drainage is adequate, constantly moist roots are fine. Good-quality water low in dissolved solids is imperative for success. Humidity is an important factor in the successful culture of masdevallias. The ideal range is 60 to 80 percent. In the home, set the plants on trays of gravel partially filled with water. In the greenhouse or enclosed growing area, humidity can be increased by use of a humidifier, while evaporative coolers help raise humidity and lower temperatures. If plants are summered outdoors, automatic misters underthe benches are recommended as is more frequent soaking. Fertilize regularly with a dilute solution while plants are actively growing. Applications of 30-10-10-type formulations twice a month are ideal for plants in a bark-based medium. A 20-20-20-type formulation should be used for plants in other media. If weather is overcast, applications once a month are sufficient. Potting is best done in the winter or early spring, before the heat of summer arrives or as new roots are produced. Plants must be repotted frequently, every one to two years, before the potting mix decomposes. A fine-grade potting medium, such as fine fir bark or tree-fern fiber, is often used with plastic pots. Sphagnum moss is also used, especially for establishing plants. The plant should be positioned in the pot so that the newest growth is farthest from the edge of the container, allowing the maximum number of new growths without crowding the vessel. Plants growing in many directions may be positioned in the center of the pot. Spread the roots over a cone of potting medium and fill in around the roots with potting medium to the junction of the roots and the plant. Firm the medium around the roots. Keep humidity high and the potting medium slightly dry until new roots form.